Gatyatmak Meru Vakrasana, also called Dynamic Spinal Twist, gets its name from Sanskrit where “Gatyatmak” means “Fast” or “Quick”, “Meru” means “Spine”, “Vakra” means “Twist” and “Asana” means “Pose” or “Posture”. Gatyatmak Meru Vakrasana or The Dynamic Spinal Twist is a part of Shakti Bandh group of asanas which are concerned with improving the energy flow within the body and breaking down neuro-muscular knots. Gatyatmak Meru Vakrasana is very useful for those with reduced vitality and a stiff back. This yoga pose provides a torsional stretch to the spinal cord and relieves back pain. Spread a Yoga mat and sit on it with both legs outstretched. Separate the legs as far apart as is comfortable without straining. Stretch the arms sideways at the same level as that of shoulders. Note that the knees should not bend throughout the practice. Exhale and turn to the left and bring the right hand towards the left big toe. Stretch the left arm behind the back, twisting the trunk to the left, keeping both the arms in a straight line. Turn the head to the left and fix the gaze at the middle finger of the left outstretched hand. Inhale and return to the initial position. Exhale and turn in the right direction bringing the left hand down towards the right big toe while practicing the pose. Stretch the straight right arm behind the back, twisting the trunk to the right and keeping the arms in a straight line. Turn the head to the right and gaze at middle finger of the right outstretched hand. This completes one round of Gatyatmak Meru Vakrasana. Practice 10 rounds of The Dynamic Spinal Twist Pose. Start slowly and then gradually increase the speed while practicing this yoga pose. Maintain the awareness on the torsional stretch of the spine and other stretches in the body along with the breath throughout the practice. After the practice, rest in Savasana. People having back conditions should not practice this asana. If there is any ailment, the advice of a Yoga expert can be taken. Gatyatmak Meru Vakrasana removes the stiffness of the back and increases the flexibility of the spine. The Dynamic Spinal Twist is beneficial in toning the digestive system and helps in relieving constipation. This asana is beneficial in improving blood circulation in the abdominal area. The Gatyatmak Meru Vakrasana stretches and strengthens the hips, lower back, pelvic organs, and spine. Gatyatmak Meru Vakrasana helps the practitioner promote deeper breathing. The asana help in improving the energy flow within the body and breaking down neuro-muscular knots. Gatyatmak Meru Vakrasana improves the vitality of the practitioner. This yoga pose stretches and stimulates the lungs and heart, and improve endocrine function. This yoga asana relieves back pain in certain cases. 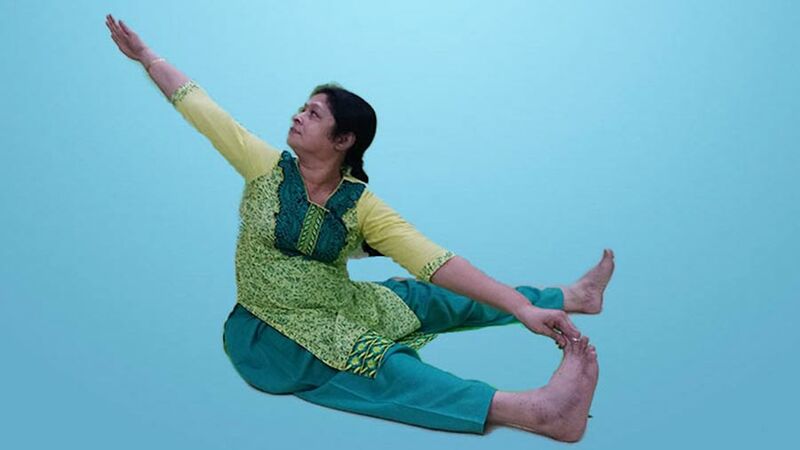 All the Shakti Bandh series asanas, including the Gatyatmak Meru Vakrasana, are useful in menstrual problems and can be practiced after pregnancy for re-toning flaccid muscles.